This month we’re joined by Production & Design faculty member Shawn Kerwin, who recently returned from a year on sabbatical. I have worked for most of my life as a set and costume designer for theatres across Canada. My formal training was in London, England at the Sadler’s Wells Design Course (later called the Motely School), and I spent another 2½ years in London working as a design assistant with various British theatre designers. After returning to Canada to design plays for a number of years, I continued my training by spending 13 months working in the design office of the Metropolitan Opera in New York. Since then I have been based in Toronto, although my work has taken me from one end of Canada to the other, as well as to the United States. My life at York began as a part-time faculty member in the late 90’s and I became a full-time faculty member in 2000. I have always believed that I should not be teaching if I was not also working as a practicing professional, so I continue to balance professional design work and teaching. Juggling these two worlds creates a dynamic full-time practice as well as a rich and vibrant life. I believe I can be a conduit between these two worlds while helping to train future generations of theatre makers. July 2018: Between Breaths, Artistic Fraud of Newfoundland, St John’s LSPU hall. I was the set and costume designer for Governor General Award winning playwright Robert Chafe’splay, Between Breaths,directed by Jillian Keiley, at the LSPU hall in St. John’s. Together with Jillian Keiley, I was a co-creator of float, presented for two performances on Canada Day, in St. John’s, Newfoundland. The project invited five choirs from across Canada to perform six new choral compositions specifically created for float. 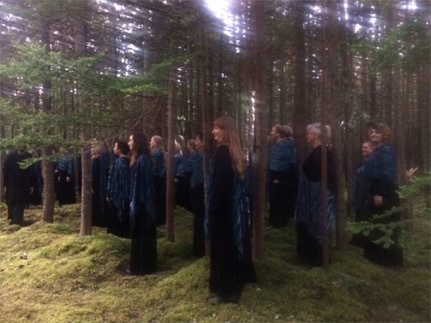 The choirs sang simultaneously in the open air, in locations throughout St. John’s Mt. Scio farm. Audiences walked (or were driven in golf carts if necessary) silently over 1 kilometer of pathways linking the different choirs. 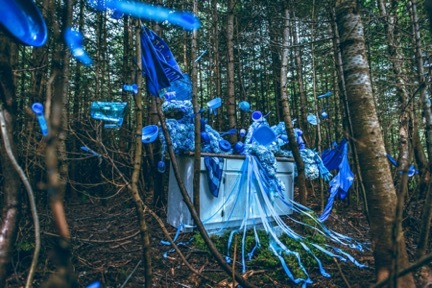 Joining each choir was a pathway of 50 site-specific installations on the theme of water and our relation to it. A difficult question, as there have been so many people who have inspired and helped me. Perhaps in my top 5, I would say Desmond Heeley. He was so totally different from me, and yet we shared a wonderful friendship. He taught me so many things when he was alive and I continue to be inspired by him. 5. What’s the first meaningful action you took after the start of your sabbatical? Beginning my life as a full-time student at the Institute without Boundaries, where I completed a postgraduate certificate in Interdisciplinary Design Strategy. 6. What are some of the projects you undertook during your sabbatical? I believe that having a sabbatical is an extraordinary privilege and opportunity to expand my horizons. During my recent sabbatical, I took on two theatre/performance design projects as well as enrolling as a full-time student at the Institute without Boundaries (IwB). 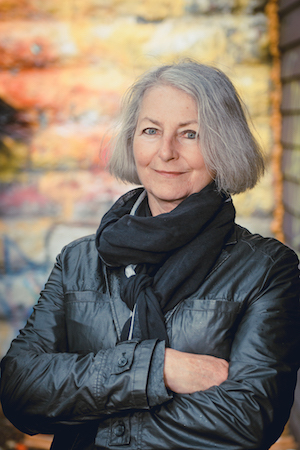 The IwB is a Toronto-based academic program and studio that offers unique educational experience and professional services. The Institute focuses on collaborative design practice with the objectives of social, ecological and economic innovation through design research and strategy. The IwB’s mission is: Fostering collaboration between disciplines to create innovative local solutions to 21st century global challenges. Becoming a full-time student in a field that was totally new to me, with people from backgrounds as varied as Sociology, Industrial Design, Architecture and Urban Planning (to name a few) provided an opportunity to step far outside my comfort zone into totally new territory. The ten-month program was intense, exhausting and stimulating. As someone who has spent a lifetime in the theatre, I came to see just how small a bubble I have been living in. Issues around the makeup and design of cities, transportation infrastructure, economic clusters and regional identities became my common lunchtime conversation. No one I was working with had much interest in theatre, let alone any significant knowledge of it. My time at the IwB was a perfect opportunity to not only reflect on what the theatre meant to me, but to open up new ways of looking at the world around me and what theatre might mean in a larger context. While being a full-time student I was also working on two projects with York alumni and award-winning director Jillian Keiley. Both projects took place this past July in St. John’s, Newfoundland. 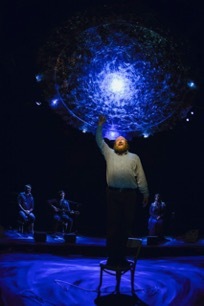 Between Breaths is a play by Governor-General Award playwright Robert Chafe, produced by Artistic Fraud of Newfoundland. 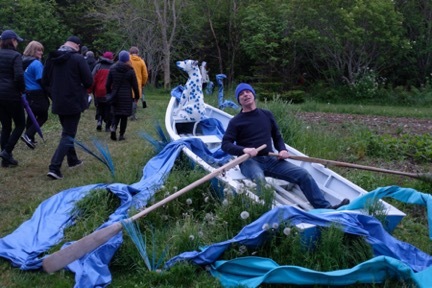 Float was an outdoor choral performance produced by Choral Canada, to be performed twice on Canada Day at the Mount Scio Farm in St. John’s. I was the set and costume designer on both projects, as well as being the co-creator for Float. Both projects contained themes of water and our relationship to it, but after that branched out into huge contrasts in location, style, and form of audience engagement. 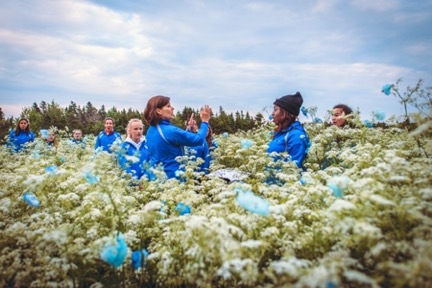 While Between Breaths was a play with live music and whale song, performed in a conventional theatre, float was a site-specific, promenade-style performance including five choirs, six composers, twenty actors and fifty installations, set on over one kilometer of farm paths in the fields and forests of Mt. Scio Farm in St. John’s. 7. What insight or discovery did you make during your sabbatical? The IwB exposed me to a scale of thinking that went far beyond anything I had experienced in theatre. Questions around how cities and regions might survive and prosper meant looking at economic infrastructures, systems design, political will for change, and international approaches to solving “wicked problems”. Considering populations in the millions meant learning how to take huge amounts of information and synthesize it into manageable and achievable thoughts and ideas. float was a project of such scale that I am not sure I could have completed it had I not been learning what I did at the IwB. I have never made a floor plan based on a Google Earth satellite image before! 8. How will you integrate what you learned/discovered during your sabbatical into your teaching? I am still trying to understand how I might integrate my new knowledge and understanding into my teaching. I suspect it will take me a good while to discover how I might best combine the two worlds I have inhabited over the past year. float: sketch for Man in Dory (one of over 50 sketches for the project). Design by Shawn Kerwin.